I was surprised that I couldn’t find this story in the Our Chinatown news blog. 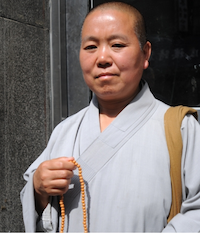 DNAInfo reports on a Chinese Buddhist nun who was arrested and detained without an interpreter for handing out malas to people who gave donations to help rebuild her temple, which had burnt down. The nun, Li Baojing Ven. Hong Yuan was “ordered to appear in Midtown Community Court on July 7. If convicted, she could face up to three months in jail and a $3,000 fine.” You can read more details about her situation at DNAInfo. Hopefully DNAInfo won’t drop this issue (or maybe Our Chinatown will pick it up) because I would really like to know how this turns out. If anyone has any more information, please don’t hesitate to drop a note in the comments. Update: Our Chinatown actually published news on Ven. Hong Yuan’s fundraising before her arrest. Apparently, the NYC police were unaware. In the scorching heat or in the pouring rain, one Buddhist [nun] has appeared on the streets of Chinatown day after day, seeking donations to repair a temple in Atlanta, Ga., that was damaged after a fire. Hong Yuan, who came to New York in 1996 and has been practicing as a Buddhist [nun] for more than 20 years, bought a house in Atlanta in 2007 that she turned into the Pu Xian Temple. On March 26, the temple caught fire while Hong was in China; no one was inside at the time. Hong said that when she returned, she was informed by her insurance company that it would not settle her claims since her name and the name on the insurance documents did not match up. Hong said that when she filled out the insurance forms to transfer her residence over to the association, she forgot to make the necessary changes to the documents, adding that she did not realize such a small oversight would have such big consequences. Photo credit to DNAInfo/Shayna Jacobs.